Dry eyes and dry mouth may also be caused by other diseases and certain medications. Although Sjogren’s syndrome is often treatable, this disease is poorly understood and cannot be cured with current medications. Sjogren’s syndrome is often not diagnosed correctly. In part, this is because dry eyes and dry mouth are common symptoms, affecting up to 15% of elderly individuals, and many physicians do not test for Sjogren’s syndrome. 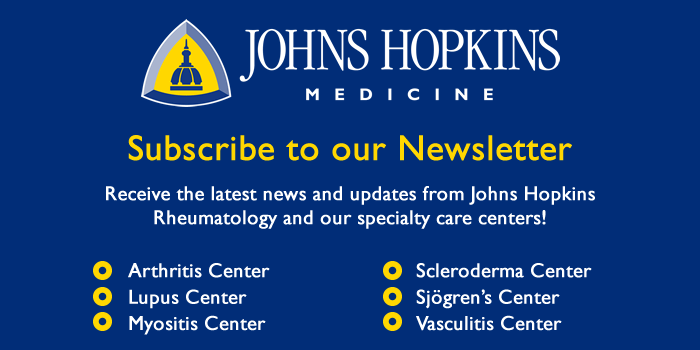 As a result, patients with the above symptoms should be tested and evaluated by physicians and medical staff who specialize in autoimmune diseases, such as those practicing at the Jerome Greene Sjogren’s Syndrome Center at Johns Hopkins. We use specific guidelines to evaluate and diagnose patients and all care is managed in one center by our caring and committed staff.